1. Add all the desired items to cart. Check on your shopping cart by clicking " View Cart" on the menu bar. Click " Continue Shopping" to go back to the product page and keep on shopping. Review your cart and print out the summary as wished by clicking " Print ". 2. Fill all the shipping information in the required column and submit. 3. Our friendliest staff will call to confirm the order. Once the order is confirmed, products will be delivered in the next day and you only need to pay when the items are received (Cash on delivery). The delivery charge of order under HK$500 will be $20 (for the first 2kg) for the places listed below. There will be a +$10 per kg afterward. This charge have been established to help offset the cost of processing your order while keeping the price of each item as low as possible. Hong Kong: Sheung Wan, Central, Admiralty, Wan Chai, Causeway Bay, Fortress Hill, North Point, Quarry Bay, Tai Koo, Sai Wan Ho, Shau Kei Wan, Chai Wan, Aberdeen. Kowloon: Kwun Tong, Kowloon Bay,San Po Kong, Tsim Shai Tsui, Jordon, Yau Ma Tai, Mong Kok, Prince Edward, Sham Shui Po, Cheung Sha Wan, Lai Chi Kok. For areas not listed above, please contact us for more information. *All orders are subject to verifications. 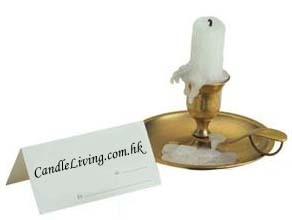 ** In case of any dispute, Candle Living holds the final decision on the delivery charge. After receiving the order online, our staff will call to confirm the order by phone during 10a – 5p. If order is placed later than 5p of the day or on a holiday, our staff will call to confirm the order on the next business day. After order has been confirmed, items will be sent in two days. If specific delivery time required, please specify on order and arrange with our staff on phone.